Do You Know Why the Government Is Targeting Your Clients? A top Obama administration official thinks staffing is bad for America's workers, and that regulators should target companies using these services—your clients. ASA senior counsel Edward A. Lenz, Esq. has published a paper explaining what steps the government is taking and why it is on the wrong track. 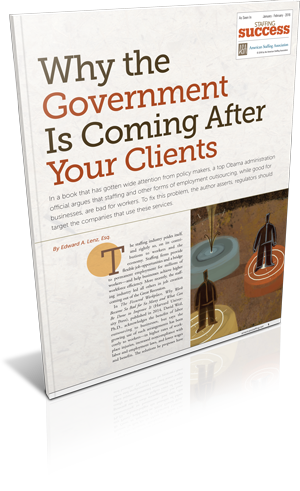 Complete this form to access a special reprint of “Why the Government Is Coming After Your Clients,” originally published in the January-February issue of Staffing Success.